← 7 Clean Great Books That are Safe for Your Teen to Read. Every country, every neighborhood has it slang and unique cuss words. 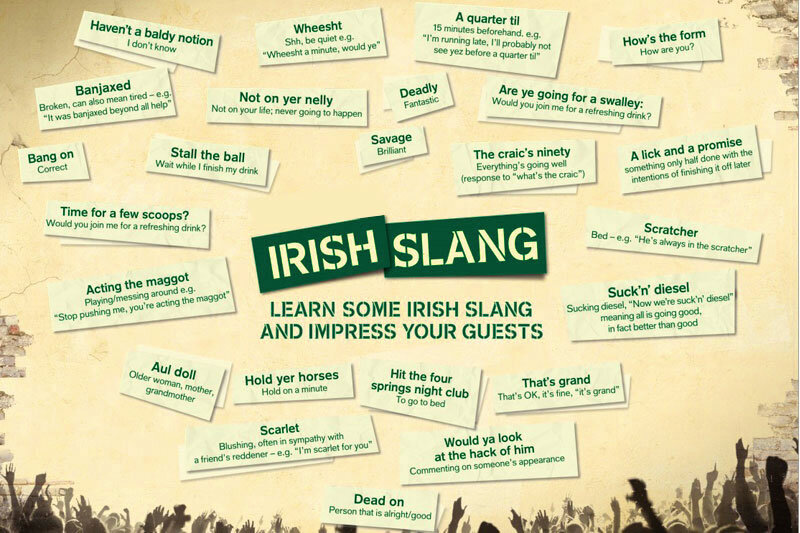 But Ireland has a unique way of saying things, that I hope you Enjoy. Acting the Maggot – Fooling and messing around. Cute hoor – A sly person, someone who quietly engineers things to his own advantage. Dub – A Dubliner. A ‘True Blue Dub’ is praise. Feck Off – Go away. GAA – Gaelic Athletics Association (Organisation responsible for Hurling and Gaelic Football). Sometimes referred to as ‘Gah’ instead of the G.A.A. Hurl – To play hurling. A hurley stick. To vomit. Or to throw. Jackeen – A rural person’s name for a Dubliner and it’s not nice. Kip – a dump. e.g. : “The hotel was a complete kip.” Or to have a sleep. Mot – Girlfriend (Dublin slang). From ‘maith’, Gaelic for ‘good’. Rugger Hugger – Girl who’s posh and goes out with rugby players (usually from Dublin). Can also be called a ‘Rugger Bugger’. Senior Cup – Major schools rugby trophy played for by schools mainly in Dublin. Sheila – a pet name for a promiscuous girl. Slag – To make fun of someone in a nice way ,nb to be used as a verb, if not has the same meaning as elsewhere ie ‘a common prostitute’. Sorry- means Sorry, also used instead of excuse me or pardon me. If you want to get to the bar say Sorry ! Town – City Centre or even the local town! Kevin and his wife Mary have been married for 25 years with three boys ranging in age from 12 to 27. He is the co-founder of Dealer Simplified a WNY company. 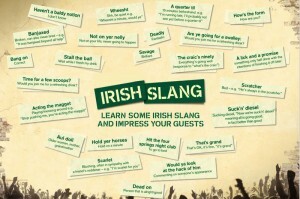 This entry was posted in Fun, Genealogy, Happyness, Ireland, OMG and tagged cuss, irish, slang, swear words. Bookmark the permalink.